The Red Virgin of Montmartre, The Grande Dame of Anarchy, The Red She Wolf what a fantastic way to introduce French anarchist, school teacher and medical worker Louise Michel. Louise Michel was born the daughter of a serving-maid and son of the family who owned the chateau where her mother worked. She was brought up as their grandaughter; a privileged upbringing but somewhat marginalised. She received a liberal education and through her family had access to the educated elite. When she left home she became a teacher, pretty much the only career open to a woman determined to support herself rather than be a wife. Her refusal to swear an oath of allegiance to Napolean III meant that she couldn’t get work in a state school so she set up her own in Monmartre. Her schools were very different from the norm, being full of animals and music. She taught the poor, disadvantaged and those with disability and she became passinately committed to charity work and to revolution. After his unexpected defeat in the Franco-Prussian War, Napoleon III surrendered to the Prussian Chancellor, Otto von Bismarck. The national guard, having been trained and armed by Napolean III to defend Paris refused to accept the surrender or to return their arms. Republican and radical deputies proclaimed the new French Republic, formed a Government of National Defense and The Commune – more akin to todays city councils than what we would now think of as a commune – was born. What the Communards wanted as a democratic republic with social justice at it’s heart. A society where co-operatives could be set up and aided by the state, anti-clerical, where women could be de-criminalised and personal freedoms respected. 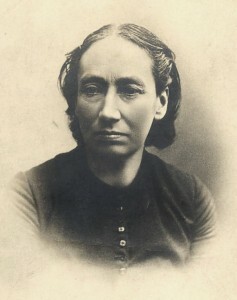 Louise Michel was at the very heart of the Commune. Initially Louise was involved in the Women’s Vigilance Committee and many of the political clubs which were often held in places appropriated from the church. She also served as an ambulance woman and treated those injured on the barricades. She herself was actively involved in the fighting and was their when the communards made their last stand in the cemetery of Montmartre. she was not executed but deported to New Caledonia, an island of Australia. During the 4 month long voyage her thoughts turned even more to anarchy. Once on the island she became something of an anthropologist, taught the children of the indigenous people and came to respect their culture, taking their side when they revolted. After 7 years she accepted an amnesty and returned to Paris, to be greeted by 7,000 people and many thousands more came to hear her talk. Louise returned to her revolutionary ways, setting out to radicalise the poor of Paris and leading a bread riot for which she was sentenced to a further 3 years in prison. After a short period of freedom she was again arrested for making inflammatory speeches and this time on her release she fed to London. Here she became involved in charitable work and philanthropy, becoming known as the Good Woman. After 5 years she returned to France, taking part in the civil unrest provoked by the Dreyfus affair. She was stopped many times during demonstrations and again incarcerated several times. During a period of illness she visited Algeria where she agitated for revolt against France. She died aged 75 while on a tour of France, still making speeches in support of anarchism. Thousands attended her funeral and the community in the suburb of Paris where she is buried still maintain her grave.